90% of our clients are on a WordPress site. 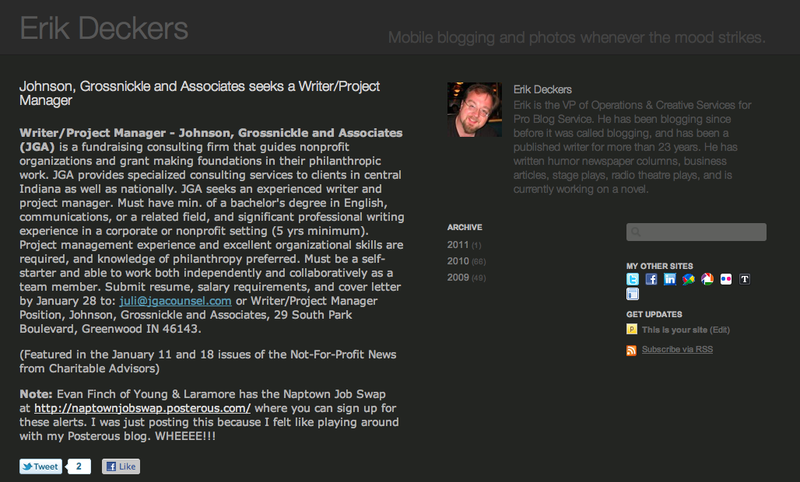 The others are either Joomla or Compendium, a blogging platform made right here in Indianapolis. 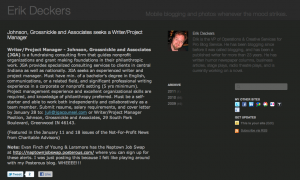 Personally, I use Blogspot for my humor blog and Posterous for an experimental/personal blog I use for conferences and social media and crisis communicationsdemos. Taking notes at Tammy Hart's WordPress Design session at WordCamp Louisville. But when it comes to this blog, our clients’ blogs, and any consulting we do, we’re a WordPress house. In fact, I’m sitting at the Wordcamp Louisville conference right now, at Tammy Hart’s session on designing with WordPress. It’s informative, inspiring, and she’s done some amazing stuff. She’s also making me feel guilty for using pre-built themes (not enough to stop, but I’ll at least feel a twinge of guilt whenever I buy one). So here are the five reasons we use WordPress, and why we think any corporate bloggers ought to use it too. You can make it do just about anything you want. Tammy says WordPress won’t do your laundry, won’t fix the economy, won’t climb Mount Everest, and won’t explain the meaning of life. * But, you can create brochure sites, basic e-commerce sites, magazines, social communities, a knowledge base, even an invoicing and time tracking system. The important thing about WordPress design is to ask yourself, “How do I make WordPress do X, Y, and Z?” not “What can WordPress do?” So far, we’ve been able to make WordPress do anything our clients need. The developers make it so easy to use. 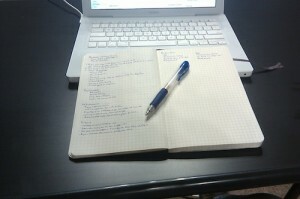 Anyone with some technical know-how, or at least the patience to figure it out, can set up a blog with WordPress.org. (WordPress.com is easy-peasy. Just go to the site, start an account, choose your theme, and start blogging.) WordPress.org lets you download the software to your own server, where you control everything — updates, themes, plugins. Everything. Tammy says “WordPress.com is like renting, WordPress.org is like buying. If you rent, you can’t knock down walls, can’t paint, can’t change the carpet. Of course, if you rent, you don’t have to fix the toilet, don’t have to fix the water heater, don’t have to fix the refrigerator.” We like WordPress.org, because we can even design the site so it doesn’t look like a WordPress site. It lets you own everything, including your content. No other site does that. Facebook, Twitter, even WordPress.com, owns the means of production and communication. If they go away, all your content is gone. If Facebook inadvertently deletes your account, all your stuff is gone. (They did that to a bunch of accounts when they rolled out Facebook Messaging a month ago, including my mom’s. They restored them all, but it showed how uncertain using someone else’s platform can be.) If Twitter goes under, all your tweets are gone. Even if Blogger (owned by Google) decides you violated their Terms of Service, they’ll delete your stuff, never to return again.But with WordPress.org, the software lives on your server, under your domain, with your content. The only thing that can make it die is you. Even if WordPress dies as a platform, you still own your copy of the software, so you can make it limp along for a couple of years until you find a suitable replacement. Why would you want to put your stuff’s safety and existence at the mercy of someone else’s whim? It’s very easy to embed photos and videos. I’ve used some other blog platforms, and embedding video and photos can be a bit of a pain. WordPress makes it so easy to upload photos and videos, whether they’re from my computer (like these two are), or they’re hosted on YouTube and Vimeo, Flickr and Picasa. Just a couple of clicks, and my media is in place. There are hundreds of reasons to use WordPress. These are just the five that make us big fans and grateful users. How about you? Why do you use it Or to turn it around, why do you hate it What is your favorite platform, and why? * Actually, yes it will. It’s 42. And you heard it here on a WordPress blog.